Load and resistance factors design (LRFD) capable. Ready to use load and resistance factors combinations from AASHTO LRFD 2007, ACI 318-08 and IBC 2006. Concrete reinforcement design from ACI 318-08. Force diagrams (moment, shear and normal) for every combination. Loads, resistances and reactions diagrams for every combination. Wall stabilities (bearing, sliding, overturning, rotation) for every combination. 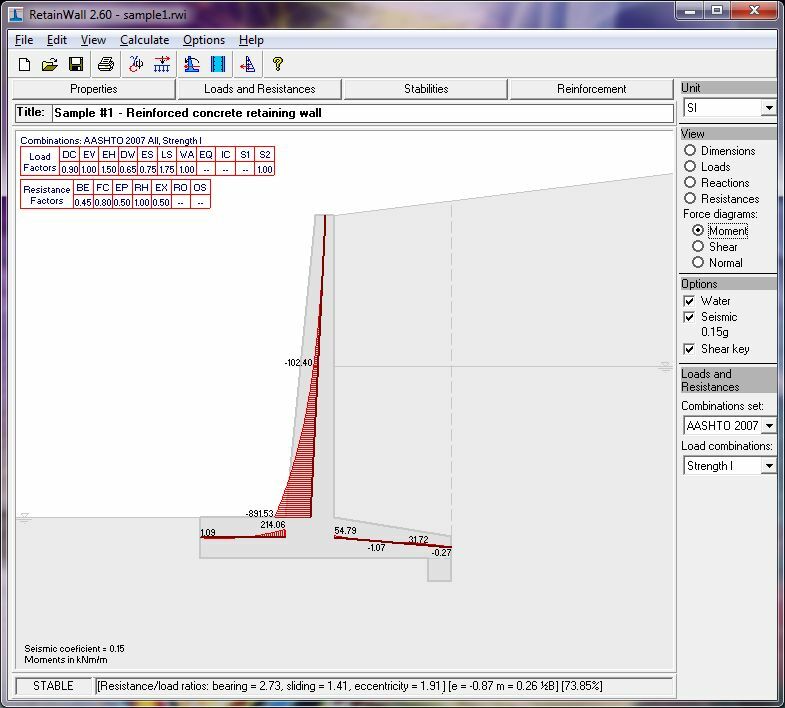 Possibilities to calculate nominal soil bearing resistance using theoretical or semi empirical methods. 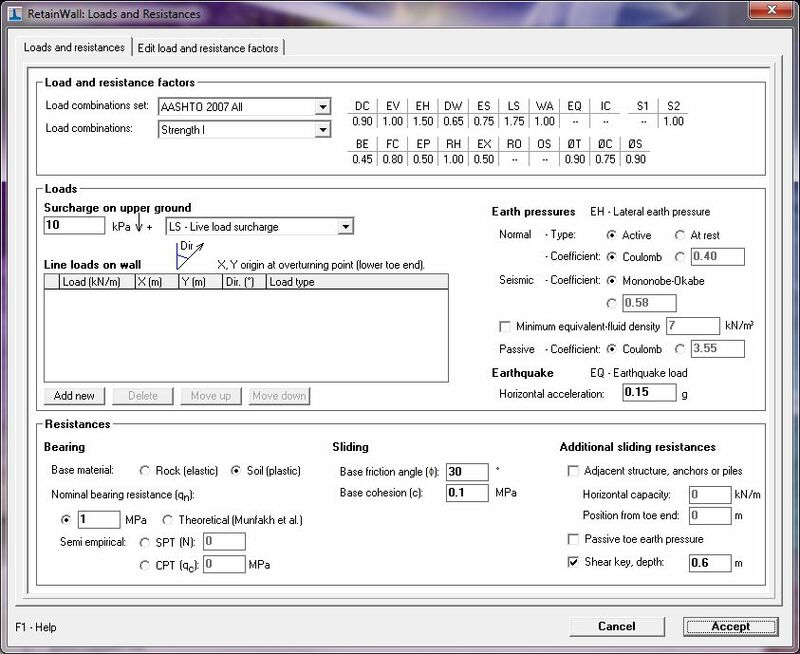 Possibilities to choose active or at rest soil pressures. Possibilities to choose elastic (rock) or plastic (soil) bearing pressures. 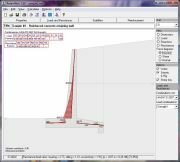 Possibilities to input user's soil pressure coefficients. Reinforcement design for upper stem, lower stem, toe and heel. 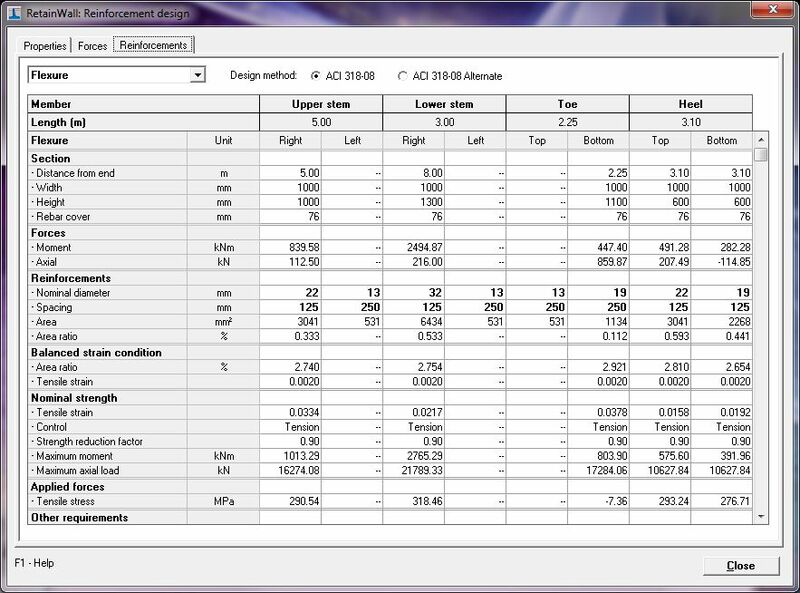 Unit systems, properties, load and resistance factors, reinforcement design method, and page setup from last editing become the default for new design. Possibilities to add other loads on wall. Provide stability resistances from a shear key, toe passive soil pressure, adjacent structure, anchors or piles. Enable or disable a shear key, water or seismic. Support metric, SI and British unit systems. Easy, clear, quick and simple software operation. Help facilities, can be printed to create manual. RetainWall is a software mainly developed for the purpose of designing a concrete or masonry retaining wall. 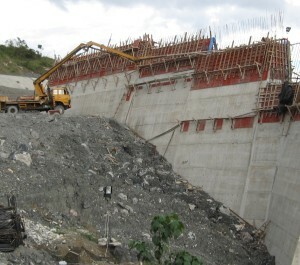 The wall may retain soil or other granular material. 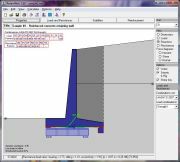 It analyses the stability of the wall based on the loads and resistances, and results in bearing pressure, sliding, overturning and rotational stabilities. Loads applied on the wall may consist of self weight, soil pressure, water pressure, live and seismic loads. Resistances may consist of base friction and cohesion, passive earth pressure, other structures or a shear key. Load and resistance factor design (LRFD) mode can be applied. 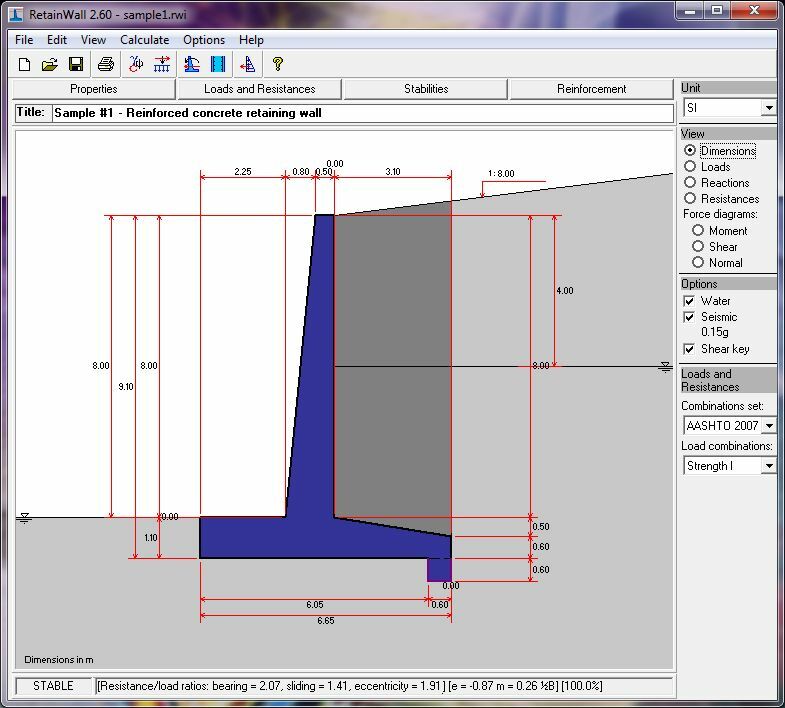 If the wall is a reinforced concrete structure, the software also supports the reinforcement design. 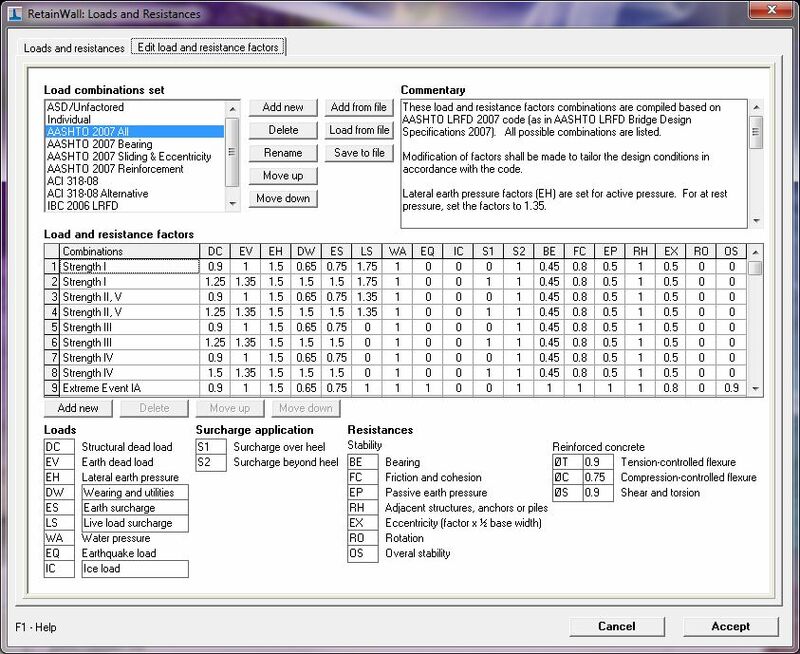 In addition, a soil pressure calculator is also provided. 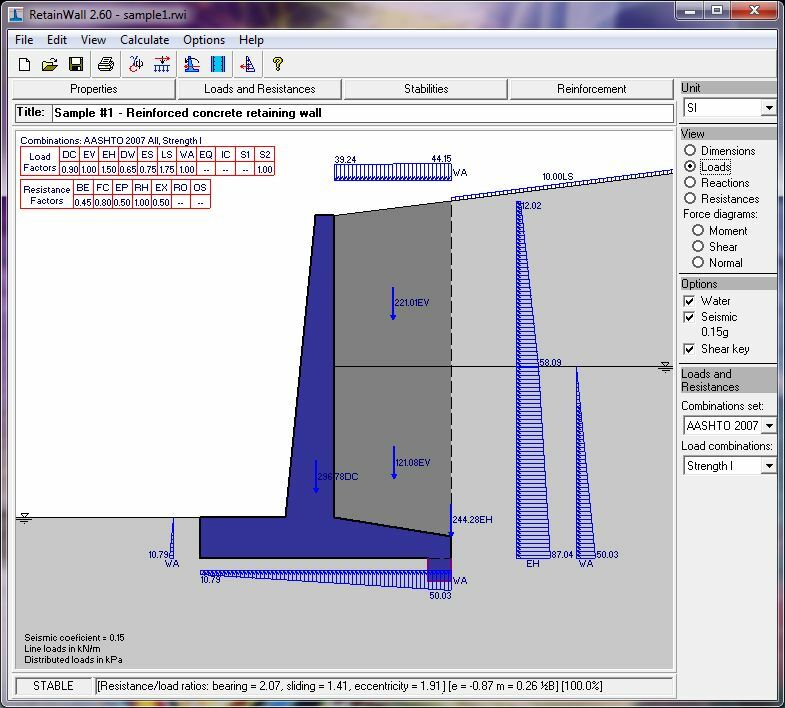 Operation of the software begins from the initial dimensioning of the wall, earth surface and water levels by clicking on the given dimensions. 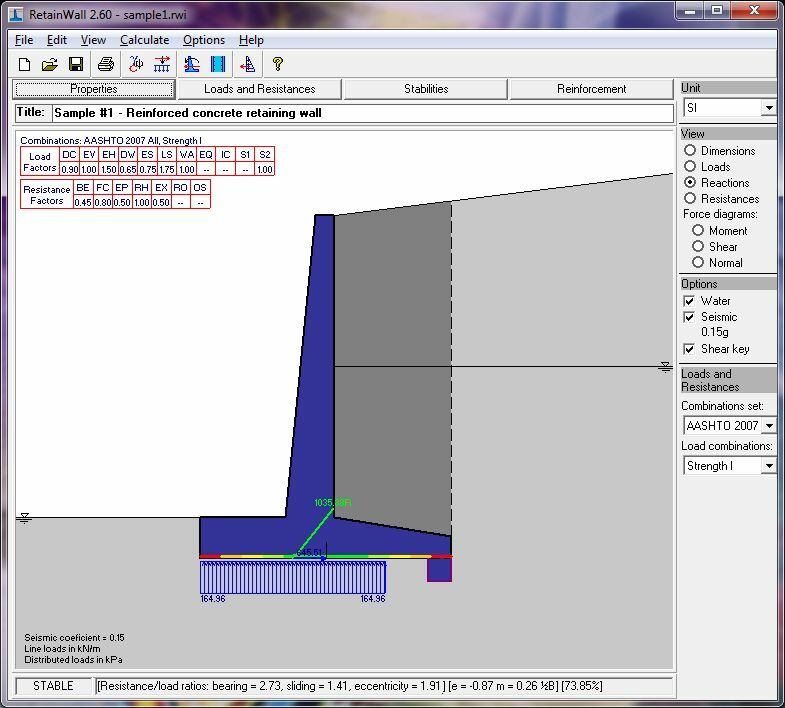 Next is inputting material properties of the wall, soil, water and reinforcement bars. External loads given consist of surcharge load, seismic load as a horizontal seismic coefficient and any concentrated loads applied on the wall if required. 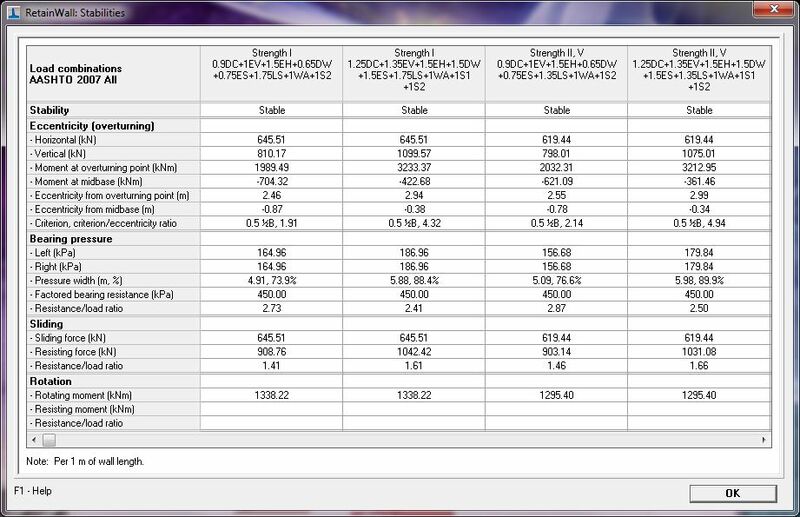 Load and resistance factors combinations can be easily chosen. Results of the wall stability can be obtained immediately. If they are not satisfied then another trial can be made very quickly. There are also options to use or not to use water, seismic or a shear key. You have the possibility to print your final results. Some features are disabled for this trial version. The software will be sent by email.